Hi Friends: It's time for a Blog Hop over at JessicaLynnOriginal Stamps! Today's Blog Hop is all about digital stamps and just how easy they are to use. 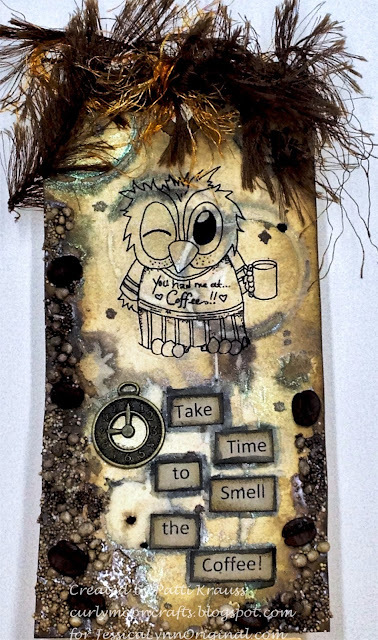 My projects use the Brentwood Owl I Need More Coffee digital stamp. Digital stamps are so easy to download and store on your computer. Once you decide on the image you want, you get that image right away. Digital stamps take up very little space, can usually be resized to fit your project, and can be organized in ways that make sense to you (I organize by theme and save with the image and designer/creator name so that I can give proper credit when using the image on my blog posts, etc.) Please be sure to follow the artist's angel policies whenever your use their images - they can usually be found at the website where you purchased the image - for example, here's a link to the JessicaLynnOriginal Angel Policy. Digital stamps are generally more economical than their physical counterparts, since they don't require the production costs associated with rubber/cling/clear stamps. You can use digital images much the same way that you use any rubber, cling, or photo-polymer / clear stamps. I print my images using a laser printer so that I can color them with my alcohol markers. As long as your printer has the capabilities, you can print them onto various materials (different paper types, material, transparencies, etc.) You can use them on cards, tags, mixed media projects, art journals, and any other projects that are allowed by the artists' angel policies. Visit all of my design teammates on the blog hop and leave a comment for each so that you can have a chance to win one of two $5 gift certificates to the JessicaLynnOriginal store. Commenting will be open until Sunday, January 22 at 8 pm CST, so get your comments in quickly! If you decide to purchase any stamps or digis from the store, please remember to put my name in the comments section. I knew that I wanted to use a coffee cup die that I have, so I sized the digital image to fit the size of the die. I printed the image onto smooth white cardstock and colored it with my Spectrum Noir markers (colors listed below). I added some clear crackle paint to enhance the feathers and some glossy accents to his beak, cup, and talons. I cut a coffee cup die from the Prima papers, then cut the Brentwood image with the same coffee cup die. To make the Brentwood image fit the coffee cup, I used a curved edge die to trim the top - the edges of the image and cup are inked with Black Soot. For the base layer, I cut the Prima papers to fit my A2 card base, used my sewing machine to add texture and interest, then used the Black Soot ink to distress the edges. I added some baker's twine to the layer, then glued it to the card base and added a white doily distressed with Black Soot. For dimension, I used some foam dots to pop the focal image in the center of the doily. I added the "stronger together" sentiment - I know I'm better after my cup of strong black coffee in the morning! To finish, I added some pearl gems to look a bit like steam coming from the cup, a baker's twine bow, and a silver key at the bottom (another play on coffee being the key to a good morning). I wanted to do a packing tape transfer, so I sized the Brentwood image to fit the size of my packing tape (about 2 inches wide) and printed him onto plain white copy paper using my laser printer. (If you don't have a laser printer, a toner based copy will work). I trimmed the image and used a packing tape transfer technique (see linked you-tube video, below) to capture the image for my tag. For my base, I used a plain manilla tag with a coffee splotch stencil and embossing paste. Once the paste was dry, I used Glimmer Mists to add color and shine to the tag, then edged it with Ground Espresso ink. I also dripped some ink splatters on the tag. I added the tape transfer image near the top of the tag and burnished well to ensure that he would stick to the tag (especially since he covered part of the embossed image on the tag). I added some coffee beans (hazelnut - the tag smells great - lol) and some Prima Art Stones using matte medium, then colored the Art Stones with the same Glimmer Mists. I printed the sentiment onto kraft cardstock, trimmed into separate words, edged with Ground Espresso, then glued them to the tag. I used a Stabillo pencil to add a shadow to the words, then finished the tag with a clock charm and some fibers from my stash. 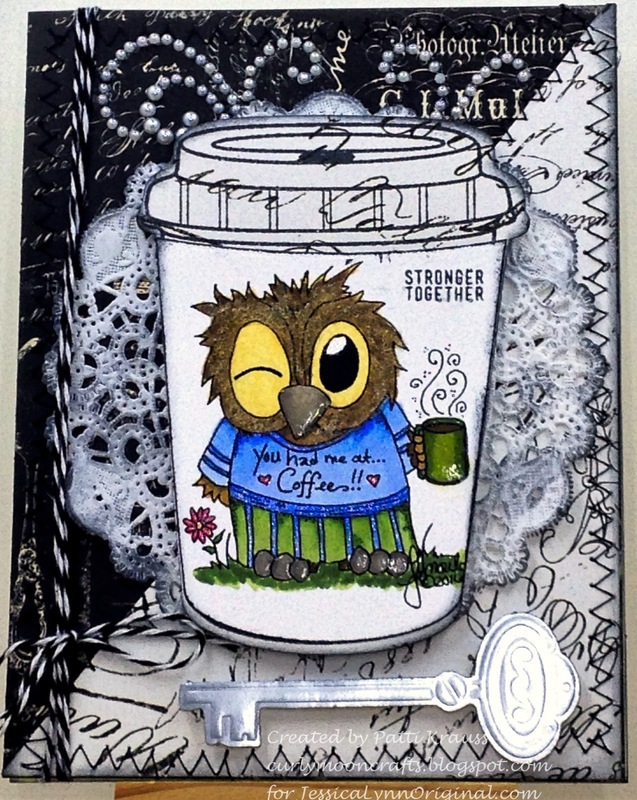 Just LOVE all of the elements on your card and tag and the colors! Very cool and very beautiful! love them both - the top one is just so darn cute!! So good! I love your mixed media work! I like Coffee and Tea have used Brentwood with his Coffee-T-shirt too. Your card is just wonderfull. Love your card and tag Pattie! I really love the tag, that is fantastic and great job with the card. Thank you for all the details in how you created them! What great work you've done with this wise and whimsical little owl! It was a treat to be able to see two different ways that the image was used and I liked the versatility you were able to incorporate. Each project is totally unique and I thoroughly enjoyed them both! Thank you for sharing your work with us for this week's Simon Says Stamp Monday Challenge!